Healthier Pumpkin Chocolate Chip Chewy Bars!! October is here! It’s time for some new recipes! I really enjoy eating pumpkin, but it’s harder to find outside of the fall season. I purchased two cans of pumpkin last week and decided to do something with them. 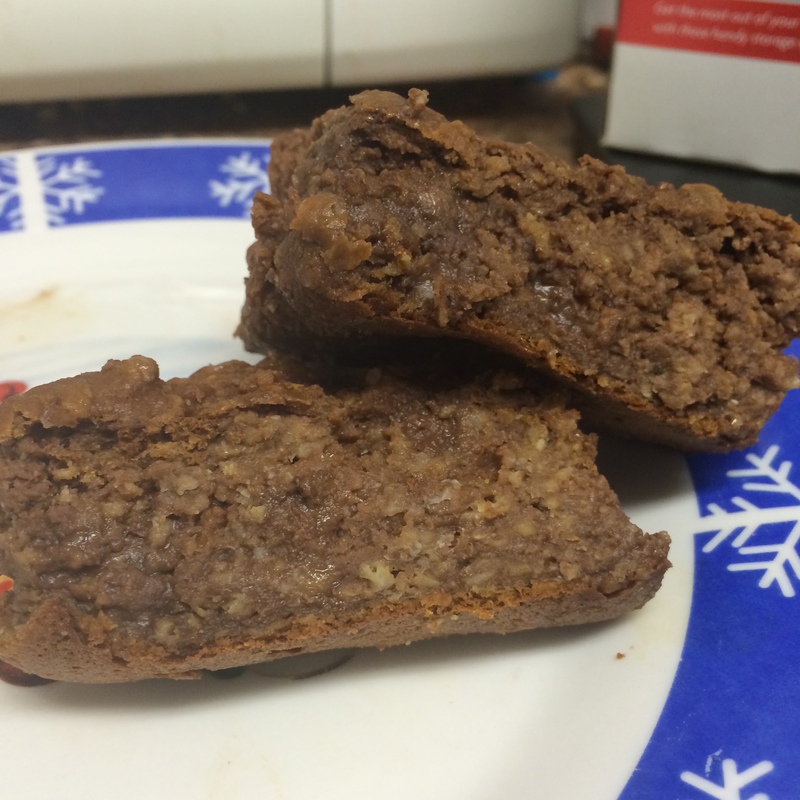 I made a healthier version of pumpkin bars that are easy to make and have a good amount of protein. I added chocolate chips because I just love chocolate. You could substitute the chocolate with nuts or blueberries. These are great pre or post-workout. 1. Spray a square glass baking dish and preheat oven to 375 degrees. 2. Take about 2 cups of dry instant oatmeal and grind in the blender until it is the consistency of flour. Measure out 1 and 1/2 cups of the ground oats and place in a bowl. Add the baking soda and protein powder in the bowl with the oatmeal. Add the flaxseed meal. Mix. 3. In a separate bowl, mix the canned pumpkin, vanilla extract, eggs, coconut oil, and chocolate chips. You can also add in stevia if you want more sweetness. 4. Add the wet ingredients to the dry ingredients and mix until blended well. Slowly add in the almond milk to make the mixture smoother, but it should still be a little thick. 5. Bake at 375 degrees for 30-45 minutes. Check often and make sure it doesn’t dry out too much. 6. Take out and cool. 7. Cut into 10-12 squares. It’s always a good idea to change up your training regimen every now and then because your body adjusts to a routine after a while and eventually it stops responding. Also, you just get bored of doing the same thing every day. If you plan to train for life, you have to find ways to make your workouts exciting. So in an effort to keep things exciting, I decided to try a new type of training called German Body Composition training for four weeks. This training parameter originated in Germany of course but was made famous by Charles Poliquin, and is based on the German Volume training program. In German Volume training, the goal is to lift lighter weights, about 60% of your max, 10 reps for 10 sets. So ultimately, you are increasing the volume of your work. When you take a look at any GVT program, it is easy to be skeptical. It LOOKS too simple. Bodybuilders are used to doing a certain number of reps for 3-5 sets. But, let me tell you that it is tough! I was sore for days because of the workload. I also needed more recovery time during the week. I trained for 3 days in a 5 day period…so, 2 days on, 1 day on, 1 day off, etc…. My program was a little different because I added auxiliary work at the end of the workout and I still did cardio throughout the week. That is why the version I did is called German Body Composition training, because your main goal is still fat loss. With GVC training, the sole focus is muscle building. Needless to say my glutes were sore for a while. After my four weeks of high volume training, I feel stronger in the gym. I have more energy while still keeping my carbohydrate intake relatively moderate which keeps me lean. I also have more strength in my cardio training. I attend spin class regularly and have noticed that I have a little bit more endurance during the class. I also have more endurance on the treadmill and running outside. So, if you want a change, or if you just want to challenge yourself, give GBC of GVT training a shot. The first week is always the hardest but if you make it through without cheating on your diet, going crazy at work, and being nice to your spouse…you should be good! Lol! It was a little rough because I had some major cravings. Each morning I got up to workout and realized I couldn’t have a granola bar, honey, or any of my usual pre-workout treats. I managed to get by with my chicken, tuna, sweet potatoes, oatmeal (YUMMY) and vegetables. I have found a new thermogenic that really helps control my cravings and provides enough energy throughout the day. (MHP Dopamite). My cardio is not full on yet so I’m not exhausted. Starting 16 weeks out allows me more time to lean out so I am not rushing the process. I have already lost 4 lbs which is great! I will weigh again in a few weeks….I am never doing every week again because I refuse to drive myself crazy. Plus the scale does not tell me what my bodyfat percentage is. When I go back to the YMCA, I will have them measure it. This week’s meals include stewed chicken and tomatoes, tilapia, chocolate protein powder, coconut oil, coconut flour, spinach, kale, cucumbers, oatmeal, grapefruit and sweet potatoes. Today is the start of a new month but for me, this day represents so much more. I have decided to compete again and today is the start of my prep. This time is different because I am creating my own plan and the thought of taking control is scary and exhilarating. I’ve had a lot of help since I started competing. My coaches have taught me the best ways to train and diet and I know what works for me and what does not. I would love to have a personal coach but finances will not allow it this time and I have the strongest confidence that I can do it. I’ve been down this road before and I created my own plan when I went from 175 lbs to 135 lbs before I started competing. I have also earned my personal training certification that enables me to understand the science behind what I am doing. I also have my friend CJ who will check in on me and hold me accountable. So here we go! My training and diet plan are done and I am ready. 16 weeks to go!